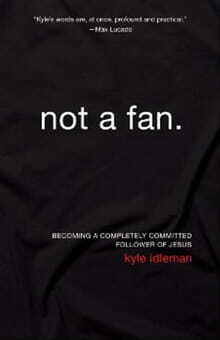 EDITOR’S NOTE: The following is an excerpt from Not a Fan by Kyle Idleman (Zondervan). Finally a thought crosses my mind: I wonder what Jesus taught whenever he had the big crowds. What I discovered would change meforever. Not just as a preacher, but as a follower of Christ. I found thatwhen Jesus had a large crowd, he would most often preach a messagethat was likely to cause them to leave. In that empty sanctuary I read of one such occasion in John chapter 6. Jesus is addressing a crowd that has likely grown to more than five Prologue thousand. Jesushas never been more popular. Word has spread about his miraculous healings and his inspirational teaching. This crowd of thousands has come to cheer him on. Almost as soon as I said it to him, I knew it needed to go further. A few days later on Easter Sunday, a crowd of thousands gathered and I began my sermon with a choked up apology. I told the crowd that I was wrong for being too concerned with what they would think and how many of them would come back. I think over the years my intentions were good; I wanted to make Jesus look as attractive as possible so that people would come to find eternal life in him. I was offering the people Jesus, but I was handing out a lot of free bread. In the process I cheapened the gospel. Imagine it this way. Imagine that my oldest daughter turns twenty-five. She isn’t married but she really wants to be. * I decide I’m going to help make that happen. So, imagine I take out an ad in the newspaper, put up a billboard sign, and make up T-shirts begging someone to choose her. I even offer some attractive gifts as incentives. Doesn’t that cheapen who she is? Wouldn’t that make it seem that whoever came to her would be doing her a favor? I would never do that. I would set the standard high. I would do background checks and lie detector tests. There would be lengthy applications that must be filled out in triplicate. References would be checked and hidden cameras installed. If you want to have a relationship with her, you better be prepared to give her the best of everything you have. I don’t want to just hear you say that you love her; I want to know that you are committed to her. I want to know that you would give your life for her. Too often in my preaching I have tried to talk people into following Jesus. I wanted to make following him as appealing, comfortable, and convenient as possible. And I want to say that I am sorry. I know it’s strange to start off a book with an apology, but I want you to know that the journey I’m inviting you on is one that I’ve been traveling. It’s a journey I continue to be on, and I should tell you it hasn’t been easy. It was more comfortable to be a part of the crowd. I know typically you put something in the introduction that makes people want to read the book. You have a celebrity* write it, or you have someone else write it so that person can tell all the readers how great the writer is. At the very least the author should write something in the introduction of a book that makes people want to read it. I’m not sure if I’ve done that . . . probably not. My guess is an apology from a man who got it wrong for a long time doesn’t exactly inspire confidence. But I just want to be clear that this book is not just information on a page or a pastor’s commentary on the Scriptures. This book is written by one of those in the crowd in John 6 who thought Jesus was great but was really in it for the free meals. I hope you will read this book and discover with me what it really means to follow Jesus. I will talk more about repentance than forgiveness, more about surrender than salvation, more about brokenness than happiness, and more about death than about life. The truth is, if you are looking for a book about following Jesus that lays out a comfortable and reassuring path, you won’t find it here. Don’t get me wrong, I want you to keep reading; I just want to be up-front and let you know there won’t be a lot of free bread. *Note: all illustrations, literal or hypothetical, that make reference to any members of family are used without their expressed written permission. *By “celebrity” I mean “Christian celebrities” like that guy who was the best friend of Charles on Charles in Chargeor the one guy who was on the Dukes of Hazzard, not the dark-haired one, the other one. You know the guy who sometimes does commercials for Country Music compilation CDs. Oh, and if Blair off the Facts of Lifecouldn’t do it I also understand Tootie is abeliever.